There are 164 members of the World Trade Organization. That's 84 percent of the 196 countries in the world. They joined to enjoy the benefits of greater international trade conferred by the WTO. The WTO helps trade throughout the world flow smoothly through its trade agreements. Members of the WTO know what the rules are. They understand the penalties for breaking the rules. They know how to play the global trade game. As such, it creates a safer trading arena for everyone. The WTO also provides its members with a fair method to resolve trade disputes. They don't have to resort to violence or war. How the WTO resolves trade disputes is important. It prevents trade protectionism, a practice that retards economic growth. The WTO negotiates improved trade arrangements among its members. 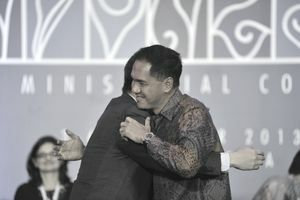 Its most recent round of negotiations took place in Bali. The largest agreement would have been the Doha Round of Trade Talks. It failed because the United States and Europe were not willing to reduce agricultural subsidies. Membership also lowers the costs of doing business by removing volatility. These general benefits extend to all members. The WTO confers three specific benefits to all its members. These specific benefits enable the general benefits mentioned earlier. First, the WTO grants each member Most Favored Nation status, which means that WTO members must treat each other the same. They give no preferential trade benefit to any one member without giving it to all. Second, WTO members have lower trade barriers with each other. That includes tariffs, import quotas, and regulations. Lower trade barriers allow members larger markets for their goods. Larger markets lead to greater sales, more jobs, and faster economic growth. Third, around two-thirds of WTO members are developing countries. Their membership gives them immediate access to developed markets at the lower tariff rate. This gives them time to catch up with sophisticated corporations and their mature industries. They don't have to remove reciprocal tariffs in their markets until later. That means developing countries don't immediately have to open their markets to overwhelming competitive pressure. Thirty-six WTO members are categorized as least-developed countries or LDCs. The United Nations grants that status to low-income countries with severe blocks to sustainable economic growth. The U.N. and other agencies provide them extra assistance in development and trade. A membership in the WTO comes with responsibilities. Members agree to avoid trade barriers and abide by the WTO's resolution of any dispute. That prevents retaliatory trade warfare. These escalating trade restrictions help individual countries in the short term but hurt world trade in the long term. This type of trade protectionism, in fact, worsened the Great Depression of 1929. As global trade slowed, countries sought to protect domestic industries. They erected trade barriers. These created a downward spiral. As a result, world trade shrank by 25 percent. The WTO has 76 founding members. They started the organization on January 1, 1995. Asia has six LDC members. They are Afghanistan, Bangladesh, Cambodia, Laos, Myanmar, and Nepal. Its founding members are Bahrain, Bangladesh, Brunei, Hong Kong, India, Indonesia, Japan, Korea, Kuwait, Macao, Malaysia, Myanmar, Pakistan, Philippines, Singapore, and Thailand. Its other members are Armenia, China, Georgia, Israel, Jordan, Kazakhstan, Kyrgyz Republic, Maldives, Mongolia, Oman, Papua New Guinea, Qatar, Russia, Samoa, Saudi Arabia, Sri Lanka, Taipei, Tajikistan, Turkey, United Arab Emirates, Viet Nam, and Yemen. Africa has the most members that are designated as least developed. They are Angola, Benin, Burkina Faso, Burundi, Central African Republic, Chad, Congo Democratic Republic, Djibouti, Gambia, Guinea, Guinea-Bissau, Lesotho, Liberia, Madagascar, Malawi, Mali, Mauritania, Mozambique, Nigeria, Rwanda, Senegal, Sierra Leone, Tanzania, Togo, and Uganda. Its founding members are Cote d'Ivoire, Kenya, Mauritius, Morocco, Namibia, Senegal, South Africa, Swaziland, Tanzania, and Uganda. Its other members are Botswana, Cameroon, Congo Republic, Egypt, Gabon, Ghana, Niger, Seychelles, Tunisia, Zambia, and Zimbabwe. Europe has the most founding WTO members. Austria, Belgium, Czech Republic, Denmark, Finland, France, Germany, Greece, Hungary, Iceland, Ireland, Italy, Luxembourg, Malta, Netherlands, Norway, Portugal, Romania, Slovak Republic, Sweden, and the United Kingdom. In addition, the European Union is a founding member. Its other members are Albania, Bulgaria, Croatia, Cyprus, Estonia, Latvia, Lichtenstein, Lithuania, Macedonia, Moldova, Montenegro, Poland, Slovenia, Spain, Switzerland, and Ukraine. Central and North America have just one LDC member: Haiti. Its founding members are Antigua and Barbuda, Barbados, Belize, Canada, Costa Rica, Dominica, Honduras, Mexico, Saint Lucia, Saint Vincent and the Grenadines, and the United States. Its other members are Cape Verde, Cuba, Dominican Republic, El Salvador, Grenada, Guatemala, Jamaica, Nicaragua, Panama, Saint Kitts and Nevis, and Trinidad and Tobago. Oceana has two LDC countries: Solomon Islands and Vanuatu. Its founding member is Australia. The other three members are Fiji, New Zealand, and Tonga. South America has no LDC members. Its founding members are Argentina, Brazil, Chile, Paraguay, Peru, Uruguay, and Venezuela. Its other members are Bolivia, Colombia, Ecuador, Guyana, and Suriname. The WTO has a category called Observer. These 20 countries have applied to become members. Except for the Vatican, they have five years to complete the process. How a country becomes a WTO member depends on its government’s ability to negotiate the six-step process. The prospective members are Algeria, Andorra, Azerbaijan, Bahamas, Belarus, Bhutan, Bosnia and Herzegovina, Comoros, Equatorial Guinea, Ethiopia, Iran, Iraq, Lebanon, Libya, Sao Tome and Principe, Serbia, Sudan, Syria, Uzbekistan, and the Vatican. Twelve countries aren't members and haven't applied to become members. They are Eritrea, Kiribati, Marshall Islands, Micronesia, Monaco, Nauru, North Korea, Palau, San Marino, Somalia, South Sudan, Turkmenistan, and Tuvalu.